On October 7th, the Wastewater treatment plant was opened, on the occasion of celebrating 260 years of Apatin brewery, the leading beer producer in Serbia. The investment worth more than 11 million euro will in a long run provide drainage and treatment of wastewater in the brewery. The Government officials of the Republic of Serbia, foreign diplomats, numerous invitees and media representatives attended the official opening. The Minister of Economy Goran Knezevic and the Minster of Agriculture and Environomental Protection Branislav Nedimovic, HE Kyle Randolph Scott, US Ambassador, HE Philip Pinnington, Canadian Ambassador, and CEO of Apatin Brewery Dragan Radivojevic took part in ribbon-cutting ceremony which marked the beginning of operation of the Wastewater treatment plant. Goran Knezevic, the Minister of Economy addressed the audience and stated that one of the most important goals of the Government of the Republic of Serbia is economy growth, and in order to achieve that, big and powerful investors are needed, but also development of SME, which along with big investors may design a good network of co-operators and suppliers. “Only after that we may expect to achieve our goal, and that is GDP growth of at least three percent in the upcoming period. The state will do everything in its power to provide the best environment and conditions that will be the most competitive compared to others in order to attract investors. On the other side, we will work on development of our economic environment – infrastructure, cutting regulations, which means passing laws that will provide security for all in our legal system. All that will contribute to increased trust of our investors and I would like to thank them, since it is obvious that the current politics in Serbia is good, and that investments such as this one today, additionally foster investors’ trust in Serbia. I wish you all a lot of luck, and to our host today, I promise that we’ll meet each requirement that they might have in the upcoming period, and we’ll also help them to be this successful“, stated the Minister. The Minister of Agriculture and Environmental Protection Branislav Nedimovic emphasized that companies such as Apatin Brewery bring new quality to this community. “I would like to thank the brewery for being socially responsible and investing in one part of the future investment which will serve to the local community. This investment is very important and it will bring new quality – often these days we could hear about chapter 27 which relates to the environmental protection, one of the most expensive chapters and that’s the road we have to pass in order to meet all qualities and integrate in the EU. These 11 million euro and plants represent an important segment of the whole story, on the the way in front of us, and that is achieving environmental protection and European integration” said the Minister Nedimovic. 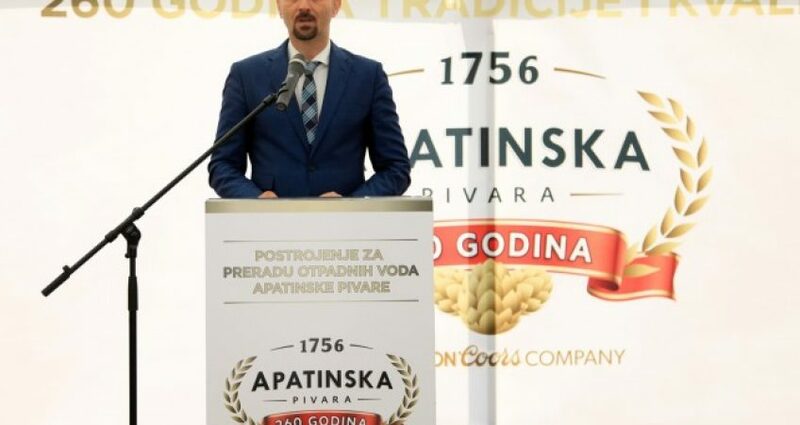 Radivoj Sekulic, the President of Municipality of Apatin, thanked Apatin Brewery for contribution it provides to the Municipality of Apatin and the whole community through its operations. “Our town used to have developed industry, brewery, shipbuilding, and textile and footwear industry. Today we have the Brewery which has always highly valued order, work and discipline. We hope that with the help of the Government and ourselves we’ll manage to get back part of former economic activities in the town, to revive them and keep the young”, said Sekulic, the President of the Municipality and a former worker at the Brewery. Apatin Brewery provided to the citizens of Apatin and surrounding areas a whole day celebration in the central town square, where the visitors could enjoy exhibition of artwork of students of the Faculty of Applied Arts related to recycling, learn about the history of Apatin Brewery which was presented in the photo exhibition. Everybody could participate in recycle triathlon, activities related to the campaign Don’t drink and drive, try limbo dance near the big Deer, walk around the town centre and learn about the traditional crafts, handicrafts and taste the specialties of Apatin. The huge excitement was brought by concerts of the famous performers who took turns on the stage – in addition to the musical performance by Big bend Dejan Petrovic, Miroslav Ilic also performed, while the rock fans enjoyed performance of groups Neozbiljni pesimisti and S.A.R.S.